It always surprises me how many rides and runs some people load up into Strava and the knock-on affect for VeloViewer is some slow page loads for those people concerned. Hopefully those days are now behind us! As well as improved page loading I’ve finally got round to adding the most requested feature from the Usability Survey many of your filled in earlier in the year: “Could we have one update button, one click does everything”. Well now you’ve got one! If you are new to VeloViewer or just want to know a bit more about Update page then this is the page for you. Basically you can’t go far wrong following your nose but read on for more detailed instructions. After being pointed out that the Velo Flow link from segments for some rides in Australia weren’t always returning results as expected I discovered I’ve not consistently using the right date from the Strava API. The majority of dates I use have been Greenwich Mean Time which is causing an issue when your ride happened to not be the same day as it was at the time in London. 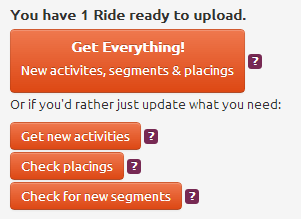 Easy fix though – once only you will need to press the “Update Ride Details” button on your Update page and then this button will disappear then all your data should be in the appropriate time zones. Great news! Strava have fixed the bug with their API that resulted in segments with people tied on time returning placings that were better than reality. This was the main “Known Issue” with VeloViewer and I’ve been completely at the mercy of Strava’s tech team for getting a fix. 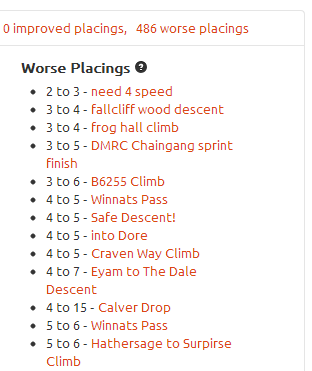 But it has arrived and with it the most depressing placings update statistics you’re every likely to get! Out of my 804 segments a whopping 486 have resulted in my placing getting worse. Go update all your placings to get all your correct placings.